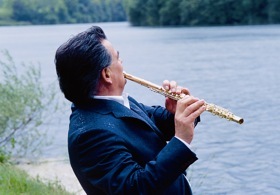 Born in Arezzo, Roberto Fabbriciani has opened up new dimensions to flute playing with his sensational virtuoso playing and innovative technical approach. He has played for the most important Festivals: Biennale di Venezia, Maggio Musicale Fiorentino, Paris, Bruxelles, Donaueschingen, Köln, München, Berlin, Edinburgh, London, Holland Festival, Music Biennale Zagreb, Warsaw, Granada, Madrid, Luzern, Salzburg, Wien, Lockenhaus, St. Petersburg, Tokyo. Soloist with Conductors such as Claudio Abbado, Luciano Berio, Ernest Bour, Riccardo Chailly, Sergiu Comissiona, Peter Eötvös, Vladimir Fedoseyev, Gianandrea Gavazzeni, Michel Gielen, Claude Halffter, Michi Inoue, Djanzu Kachidse, Vladimir Jurowsky, Peter Maag, Bruno Maderna, Diego Masson, Ingo Metzmacher, Riccardo Muti, Zoltan Peskó, Josep Pons, David Shallon, Giuseppe Sinopoli, Arturo Tamayo, Lothar Zagrosek and with prestigious Orchestras, such as the Orchestra of Teatro alla Scala in Milan, the Accademia of Santa Cecilia in Rome, RAI Orchestras, ECYO, London Sinfonietta, SWF Baden - Baden, RTL Luxenbourg, BRTN Brussel, Orchestre Symphonique de la Monnaie, WDR Köln, Deutsches Symphonie-Orchester Berlin, Bayerischer Rundfunks, Münchener Philharmoniker, and others. He is a passionate interpreter of the New Music and collaborated with composers such as Luciano Berio, Pierre Boulez, Sylvano Bussotti, John Cage, Elliott Carter, Aldo Clementi, Stephen Davismoon, Luis de Pablo, Franco Donatoni, Jindrich Feld, Brian Ferneyhough, Jean Françaix, Toshio Hosokawa, Ernest Krenek, György Kurtág, György Ligeti, Luca Lombardi, Olivier Messiaen, Ennio Morricone, Luigi Nono, Goffredo Petrassi, Henri Pousseur, Wolfgang Rihm, Jean-Claude Risset, Nicola Sani, Giacinto Scelsi, Salvatore Sciarrino, Karlheinz Stockhausen, Toru Takemitsu, Isang Yun, who have dedicated to him some works among the most significant of the flute literature. He worked with Luigi Nono at Experimentalstudio Heinrich Strobel in Freiburg (Germany) opening absolutely new ways for the music. "…le sorprendenti innovazioni di Fabbriciani (anche lui (calato) nello studio di Freiburg, e io (calato) nella sua maestria)." "…qualsiasi cosa egli suona è sempre nel modo migliore." "…Ho la più grande ammirazione per la sua favolosa arte flautistica." He teaches master classes at Mozarteum Academy in Salzburg and New York University.